The quest for a more youthful me started when I turned 50 last February--even though I exercised regularly and ate a healthy diet, I was not able to get rid of some stubborn fat pockets that seemed to arrive out of nowhere. Plus, my skin was not tight and taught like it used to be. Of course the reason for this was age--my body was losing estrogen and collagen quickly. I thought about what could I do to turn the clock back a decade and help others do so as well. Was this possible? I wanted my tight cellulite-free body back without going under the knife. There's a way to change your body through some great groundbreaking treatments that can be performed at a med spa, a plastic surgeon's office or even at a dermatologist. Many of these procedures promise quick and pain-free results in order to get your trouble areas smooth, tight and cellulite free. While there is no substitute for diet and end exercise, I have found a few of these to be worth the spend (this type of body shaping is time consuming and does not come cheap)! Over the past eight months, my body has been vacuumed, heated, frozen and shocked more than I would like to admit! Below, I share my experiences with the following body shaping treatments: SkinWave, Cool Sculpting, Viora, Zwave, Microcurrent Nano Frequency Technology, VelaShape and i-Lipo. Some of these procedures offered can help improve body appearance and result in a more svelte figure. All of them are non-invasive, have no down time and are pain-free or tolerable. Read on to see what works best! The anti-cellulite and skin tightening treatment by SkinWave is currently one of the best, new procedures available today. I discovered the center while doing research for this story, and came upon an article in the DailyMail about how Madonna purchased an anti-cellulite acoustic wave therapy machine that seemed to work wonders. After digging some more, I found out that this technology was recently brought here from Paris to Los Angeles with its first center located in the heart of Beverly Hills. My first reaction was, "Where do I sign up for this?" SkinWave treatments stimulate collagen production that reinforce the dermis and epidermis. This is achieved by the process of emitting acoustic waves directly onto the troubled areas to boost blood circulation and provide better plasticity of connective tissue. The protocol includes 8-10 weekly sessions and can be used to treat cottage cheese thighs, buttocks, tummy and "bat wing" underarms. Maintenance is once monthly after the 8-10 sessions are completed. This procedure is not for weight loss but is game-changing for cellulite reduction and skin tightening. The acoustic waves infiltrate the tissue via rapid pulsations on the surface sending pressure waves deep into the underlying skin where the cellulite develops. They claim it's painless but I would call it tolerable (one of the heads that emits the acoustic wave during the treatment feels like strong tapping pressure and the other one feels like a shock wave), especially on the thighs and bottom. SkinWave is 100% natural and does not destroy any cells (it only shrinks them)! What is Acoustic Wave Therapy? AWT is a procedure that has been used for many years in Europe to disintegrate kidney stones and to ease joint pain. Its skin-smoothing abilities were discovered by chance while treating the joints of female athletes when doctors noticed a big improvement in the appearance of their thighs. It soon became clear that this machine could be marketed and used for the cosmetic beauty business. The technology for cosmetic purposes is new to the U.S. and has recently been approved by the FDA for treatment of cellulite, sagging skin and wrinkles. Currently, there is only one SkinWave Institute in the country and it's located in the heart of Beverly Hills. Founder George Zaoui is currently looking to expand to other major cities. I found SkinWave to be the most effective non-invasive treatment to diminish cellulite, tone and smooth the skin. I actually saw results after ONE treatment. The treatment can also be used on the face to stimulate collagen and prevent wrinkles. I completed treatment of my thighs and was so happy with the results that I moved on to my face and tummy! The wrinkle treatment for the face and neck takes about 20 minutes and is totally painless. The tummy is a 30 minute painless treatment as well. Thighs and bottom are more sensitive and take approximately one hour to treat. It is advised to drink a lot of water following treatments to aid in lymphatic drainage. I saw cool sculpting being advertised on almost every street corner in LA and figured it was worth a try to see if it really could freeze away my annoying extra fat pockets. I treated several areas including my outer thighs, flanks and my stomach by purchasing a package deal. The process was uncomfortable in the beginning when the suction vacuum and freezing started to kick in and when the device was removed following the treatment. I also had numbness and bruising that lasted a few weeks post treatment. CoolSculpting uses controlled cooling called Cryolipolysis to target and kill only the stubborn fat cells that stick around despite diet and exercise. These targeted fat cells are then released from the body in a completely natural process. For me, the best results were on my outer thighs--they were about 10-15% slimmer than before the treatment. I did not notice much of a difference on my stomach but a bit on my flanks. I think this procedure needs to be done more than once for desired results and can't be compared to the fat removal of liposuction. The good news is, once the fat cells are treated, they are gone forever. Best results are seen about three months following treatment. This is something I would try again now that it's been eight months since the initial treatment. CoolSculpting available throughout the U.S.
All hooked up for microcurrent nano frequency! This treatment uses a combination of therapies including Viora, Zwave and microcurrent nano frequency. All three technologies are performed during each visit in the order listed above. Michael Farah runs the spa and personally lost 85 lbs by experimenting with this unique combination of fat burning and skin tightening procedures. The treatments combine radio frequency, nano technology and radio pulse therapy. All of these treatments can be done separately as well, but the results will not be optimized. The Viora uses CORE technology which targets specific layers of the skin to precisely heat the underlying network of collagen and elastin fibers, increasing the metabolic rate of subcutaneous tissue. The collagen then shrinks and the rigid collagen’s cross-links are broken, and your skin's flexibility and strength are restored resulting in firmer, more elastic skin. The area needs to be heated to 38-42 C for this procedure to work. You can feel the heat is being emitted during the session plus a pulsing vacuum sensation. A six session package is recommended to see best results. This machine uses high energy radial shockwaves that are scientifically proved to have a large impact on collagen structure and the skins connective tissue. Benefits include improved blood circulation, softening of fibrotic structures (scar tissue), strengthening of the connective tissue, improvement of the dermal elasticity, firmness and cell regeneration. The high energy radial shockwaves consist of two different parts – positive pressure pulse and a comparatively small tensile wave component. The shockwave squeezes the surrounding tissue and breaks the grid structure of the molecules. The tensile wave leads to a collapse of the gas bubbles within the fat structures. This treatment felt similar to the technology offered at SkinWave but was not as intense. During this treatment, muscles contract comfortably brought on by the conduction pads that are placed on your skin. The system uses a microcurrent technology to achieve results without any pain or uncomfortable muscle spasms. As the process goes on, the settings are increased to be more effective. 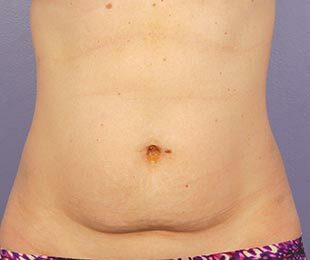 The results of this treatment are similar to doing hundreds of sit ups and crunches to achieve a flatter belly area. Along with loosing inches, the Nano Frequency technology claims to tighten skin, tone muscles, and reduce cellulite. This regimen seems like it could be overkill but I am guessing it works well if you stick to the planned number of visits and treatments. I only tried this triple procedure one time and would like to continue to see the final results. Pricing varies according to area. Packages available. VelaShape™ claims to contour and slim the body by improving cellulite and reducing circumference in as few as 1 treatment session with it's elos technology. The technology combines infrared light, bi-polar radio frequency energy and vacuum, which cause deep heating of the fat cells, their surrounding connective tissue and the underlying dermal collagen fibers. This stimulates the growth of new and better collagen and elastin which results in localized reduction in skin laxity, body volume and an overall improvement in skin structure and texture. I did six sessions on my thighs and only saw a slight improvement. If you plan to try this technology, make sure you get the treatment at a place that uses the most up to date machine, Velashape III. The i-Lipo technology uses low level lasers for smoothing cellulite, fat reduction and body shaping by breaking down stored fat and turning it into energy. This completely painless process promises a slimmer body due to the release of unwanted fat cells. i-Lipo claims that you will lose inches after 10 sessions and go down 1-2 dress sizes. The way it works is by maximizing the body’s lymphatic flow through stimulation of the nodes in your treatment area. It is recommended to exercise following treatment to metabolize the newly released fatty acids and glycerol in order to completely remove them from your body’s fat storage. I wish I could say that I saw a difference in my body after several sessions, however, it did not seem to work well on me! One of my favorite go-to places for body and face treatments is The KO'AN center located at 1301 20th Street, Suite 150A, Santa Monica. This beautiful center for integrated aesthetic medicine offers a variety of services for body and face restyling. Keeping the body smooth, slim and tight is an expensive and time consuming endeavor. I don't think most of these procedures are miracle-workers but some can improve your body in conjunction with proper diet and exercise. An important thing to remember when doing any procedure is to go to a reputable place with proven results and excellent technicians!